Founded in London in 1737 by William Offley, initially as wine merchants. He played a key role in expanding Offley and the Porto Wine industry in the Nineteenth Century. A blend of a selection of high quality grapes from the traditional red varieties that flourish in the Douro region, namely Touriga Franca, Tinta Roriz, Tinta Amarela, Tinta Barroca and Tinto Cão. 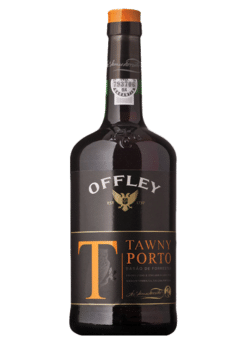 With an attractive red-tawny hue, typical of an older wine, Offley Porto Tawny has a delicate aroma reminiscent of ripe red fruit and enhanced by nutty notes that provide it with an added complexity. In the mouth, there is a fine balance between soft tannins and natural sweetness which combine towards an elegant and fine finish. To be enjoyed as an aperitif paired with olives, or with desserts such as caramel, apple or almond desserts.